Soon to be one of the largest master planned Toronto condo communities, the Canary District Toronto waterfront condos will be part of the exclusive and exciting new West Don Lands and Pan Am Village. The 2015 Pan America Games in Toronto will literally transform this area single handily into one of the most beautiful and liveable neighbourhoods in all of the city. The new Toronto Canary District waterfront condos for sale will be brought to the market by Waterfront Toronto and Dundee Kilmer Developments Limited. Following the successful launches of the Toronto West Don Lands River City Phases 1 and 2 condominium releases, the next step in the revitalization of the Pan Am Village neighbourhood at West Don Lands Toronto waterfront district has been awarded to Dundee Kilmer Developments Limited, a notable and very experienced builder of high-end homes. This is a joint collaboration between 2 of the countries’ best in Dundee Realty and Kilmer Van Nostrand. 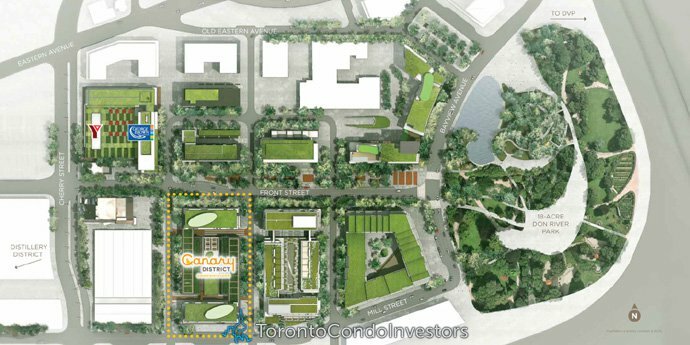 The eventual master plan for the Canary District Toronto condo project will be thousands of new homes, a brand new eighteen acre expansive urban park called Don River Park and lots of new retail, shops, restaurants, sidewalk cafes and cultural facilities. Also, just outside your door will be numerous recreational options for the healthier lifestyle that complements the eco-sensitive and eco-friendly Canary District Toronto condo project offering. Marketed on Talk Condo as ‘the largest urban village in Toronto history’, the waterfront Toronto Canary District condos is going to be well designed both inside and out and will give homebuyers true value no matter what you are looking for. Register online at www.canarydistrict.com for more information as it is released as well as to submit your details for upcoming sales launches. Also, the developer web site for the waterfront Toronto Canary District condos is located at www.dundeekilmercondos.com. Master planned from ground up, the new Toronto Canary District condo development will be a multi phased project and will feature Toronto’s largest urban village. 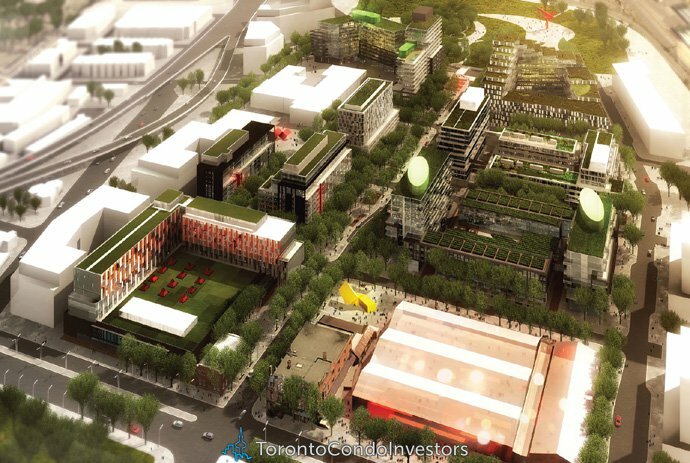 Located between Moore Park and the Distillery District, the Canary District Toronto condo project will improve 20 acres of land that will unite both the East and West Don Lands neighbourhoods and present a truly liveable and walkable neighbourhood to other great communities around the area. 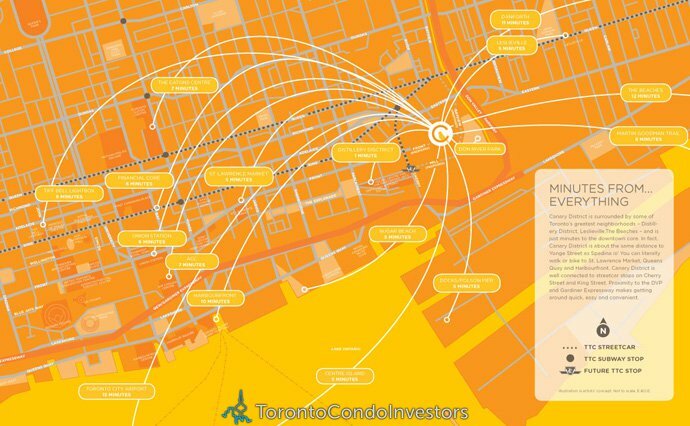 In 2015, the City of Toronto wil be hosting the PanAm Games and the Canary District Toronto condos will be part of this plan for the eight thousand athletes and over two thousand support staff for this incredible world event. The awe inspiring vision of Dundee Realty (developer of this West Don Lands area) is seen through the new Canary District Toronto West Don Lands real estate development as well as in previous projects such as the River District, Gooderham and The Carnaby to name a few projects). As part of the community plan for the Canary District Toronto condo community, there will also be the largest state of the art YMCA in Canada at over 100,000 square feet in size as well as 800 brand new residential condominium units available with avant garde architecture and design. Of these new market suites the Toronto Canary District Condominiums will feature 369 suites for sale over an 11 storey mid-rise tower. It will feature a private courtyard which provides both outdoor and indoor amenity/entertainment space in addition to an informal landscaped area, water feature and an amenity pavilion. The West Don Lands Toronto real estate revitalization project where the new pre-construction Canary District Toronto condos are located will also be home to an 18 acre park along the lake as well as bike paths, walkways, green spaces and all the amenities of a large city but with a smaller and more boutique urban community feel. Also walkable from your new Toronto Canary District condos for sale is retail shops at Yorkville and the Distillery District. The Canary District Condo project is divided into two phase one building launches. The first is the North/West Block at Canary District Toronto West Don Lands condos which introduces studios to two bedroom plus den/media floor plans (one level) as well as 1 bed to 2 bed+den Toronto Canary District townhouses for sale as well. In the North/West Block, studio plans will start from just $232,900 while the 1 bedroom units start from $271,900. The 1 bedroom plus den suites will start from $273,900 while the 2 bedroom Canary District floor plans start from $404,900. The 2 bedroom plus den/media room layouts in the North/West Block at Canary District condos will start from $439,900. The Canary District Townhome floor plan TH1 is a 1 bedroom home at 584 square feet facing West and starts from $319,900 while the TH2 price range for a 2 bedroom plus den unit at 1148 sqft facing west starts from $599,900.